You know it’s a hard job teaching anyone on how to do anything for a lengthy period of time: piano lessons, strength training, math (definitely)…and, of course, swimming. And that’s a profession that is of the most intense given the level of professionalism and safety precaution. Thankfully, you can expect to not see a whole lot of competition in the field. But just in case…. You have a winning gift to give for this market — on both the customer level, and employee level! Imagine at the end of an entire summer session giving out these really cool corded earplugs as a THANK YOU gift, branded with your label, reminding both student and parent/guardian that you are the standard in swim instruction. That’s the feeling, worth every penny, and ensuring your reputation carries on to the next class — and the next class. In a nutshell, you ensure you keep your student base strong with the little steps you take in proving that you’re a professional. Moreover, let’s just say you have swim instructors as your employees, and you want to enhance their professional image as well. For longevity and a promotional brand gift that lasts, this spreads the reputation throughout your entire regime and never gets old. Essentially Your Students Will See That Your Instructors Mean Business. Plain and Simple. And when they mean business, they exude authority. They’ve got the brand on them. And a double whammy when at the end of the class, the students get the exact same gifts as a THANK YOU. A feeling of accomplishment. Pride. Loyalty. That’s branding at its best. Who knew something as little and almost insignificant as branded ear plugs could make any bit of difference to your business? The fact is you’ll never know until you put yourself out there. So check us out at BRAVA Marketing. 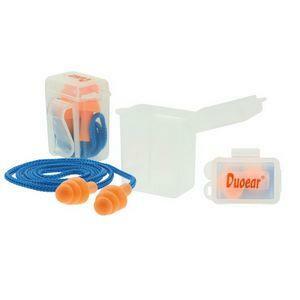 We have a variety of options of ear plugs to work with. Contact us today when you’ve decided to up that professionalism in your swim instructing game!